TUMEKE! : Are Climate Deniers taking over Fairfax? Are Climate Deniers taking over Fairfax? ...these filthy liars who are purposely smoke screening the realty of climate change and the fact it is our pollution that creates it are buying up our mainstream media. As if you needed yet one more reason to switch off. A crock cooked up and endorsed by every scientific body on the planet, in all the physical and earth sciences, no exceptions, with thousands of researchers all in on it together and with not one whistleblower, ... yeah right, plain as day. Qualanqui, let go of your konspiracy theories, you'll sleep better without the fear of the black helicopters coming to take you away, or else be prepared for most to regard you as a kook. The vast majority of competent scientists do agree that global warming is a problem. Whether they agree that carbon taxes are an appropriate response or not is another issue altogether. I, for one, don't. All carbon taxes do is shift the burden onto the consumers and leave the producers alone to make their obscene profits. In other words, we pay so they can pollute as usual. And yes, Monckton is a mental fuckwit who spouts more crap than John Key on his worst days. Goebbels once observed that any lie, no matter how preposterous, will be widely believed provided it is told often enough and to as many people as possible. The promotion of AGW is a propaganda campaign that he would certainly have been proud of. It is not often that one can open a newspaper, or tune in to a mainstream television or radio news broadcast and find no mention of global warming. The public has repeatedly been told that there is a scientific "consensus" in favour of AGW. That is absurd. Science is not done by consensus. That has never been the scientific method. Science is based on repeatable experiments and verifiable facts, both of which are absent in any "consensus". If science were done by "consensus", a ballot would have settled the question as to whether the Higgs particle exists and 9 billion dollars could have been saved. In any case, one does not need any scientific knowlege at all to see AGW for the scam that it is. One only has to look at the proposed solution to this "problem" to determine that it is nothing more than a political power grab. Those with the most to gain from the widespread public acceptance of AGW are the big spending, big borrowing, vote buying left wing politicians, and the crony-capitalists who benefit from their taxpayer funded subsidies and corporate welfare handouts (Solyndra anyone?). It is therefore obvious that this great fraud has nothing to do with science. It is 100% political. The line that divides believers and unbelievers is no different from the boundary that separates those who want more freedom, less government and lower taxes, and those who want the opposite. The proposed solution to AGW is of course more government, more regulations and more taxes. If only the peons would just give up more of their money and submit more of their rights and freedoms to the whims of the politicians, these same politicians would then be able to save them from the grotesque hell that has been predicted and promoted by villains and fools alike, from the brutal despots and disreputable crooks who populate the UN and the IPCC, all the way down to the mixture of disheveled street dwellers and mummy's boys who make up the bulk of the "occupy" movement. Some of these naive dupes will quite possibly be looking to North Korea for inspiration because they would arguably have the smallest carbon footprint of any country on Earth. Oh Bill you are so amusing, I love how climate deniers like you live in a special kind of world. It's a world where nothing the 7billion human beings (an unprecedented number of us mind you bill) have NO IMPACT whatsoever on the planet. It's a lie. Human pollution is causing global warming. FACT. The claim by climate denial volk like you that we have no impact on the planet just can't be taken seriously. That's right Bill, the evil Heartland institute funded by big oil and big mining only have your best interests at heart. Sorry, I can't keep writing as I'm laughing so hard at you truing to defend big oil and big mining caring for us. Climate deniers are creationists at an evolution conference. Bomber, have you had a read of "Heaven+Earth"? Would be interested in hearing any sensible comments you have on the content. "Heaven + Earth", written by Plimer who is on the board of at least 3 mining companies, is a work of fantasy. It is also scientifically dishonest, often citing references which say exactly the opposite of what Plimer claims. One of his amazing discoveries is that the sun is made of iron rather than hydrogen as everyone had thought. Anyone talking about massively funded lies need look no further than the climate denial networks funded by the fossil fuel industry. "Heaven and Earth" is a comforting bed time fairy tale for poor miners and oil magnates. They at least have a material reason to promote it, anyone not making billions from fossil fuels who gives the least credence to Plimer and Monckton's crap is mentally challenged and delusional for no good reason. I have gotten completely mistrustful of both sides of this debate now, one could be funded by oil interests the other financial market type players, both are dodgy as f*k. The age of disinformation? Your response to my previous post has a remarkable similarity to a herd of farmyard animals, all hissing, mooing and braying at something that offends them, but being otherwise unable to express anything except disapproval. Firstly, whether or not humans have an impact on climate is irrelevant, and would remain so but for the doomsday predictions that accompany the AGW claims. There is no reason to believe that if humans could affect global temperatures, it would necessarily a bad thing. 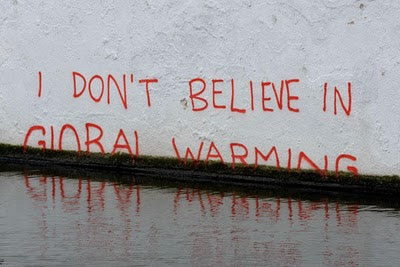 "Human pollution is causing global warming. FACT." If human-driven global warming is a FACT, where is the PROOF? "The claim by climate denial volk like you that we have no impact on the planet just can't be taken seriously." I have never claimed anything of the sort. I don't know what or how much influence human activity is having on the climate, AND NEITHER DOES ANYBODY ELSE! For all anyone knows, it might be offsetting the ice age promised by the doomsayers of 30 years ago. The absurdity of the AGW claims are mostly to do with the catastrophic predictions that make up the main part of the propaganda campaign, and the proposed political solutions that are being sold to the public as a solution. "Sorry, I can't keep writing as I'm laughing so hard at you truing to defend big oil and big mining caring for us." You can't keep writing because you have very little left to write. Perhaps that is also the reason for your careless typing. Oil and mining were not mentioned in my previous post. However, since you have drawn attention to them, I do not have a problem with "big oil" or "big mining". If a business or corporate entity annoys me in any way, I will respond by refraining from buying their products. Perhaps you should consider that option yourself. I neither want nor need their "caring", nor am I bothered that they don't have my best interests at heart. I don't pay them for that. I pay them for the products they produce, that is all. However, I am glad that they have made these products available, for that is how I am able to put gas in my car; and if it weren't for the mining companies and other corporates and businesses, I would not be able to reply to your blog any more than you would be able to run it. You offer nothing to the debate that you rhetorically question the purpose of, except wild doomsday predictions that appear to be motivated by blind panic. In short, your contribution is emotive, inaccurate and devoid of reason.